A superb model, filled with features you’ll love. Easy enough for a novice, while offering enough control to satisfy most purists too. Recommended for: Anyone. Everyone. If you can afford it. 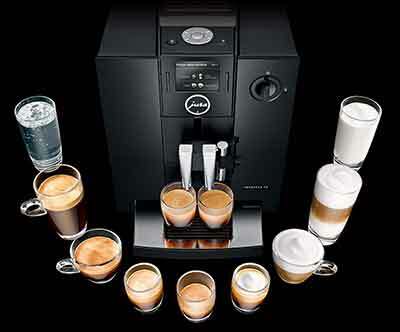 Are you looking for a modern, stylish super-automatic coffee machine? 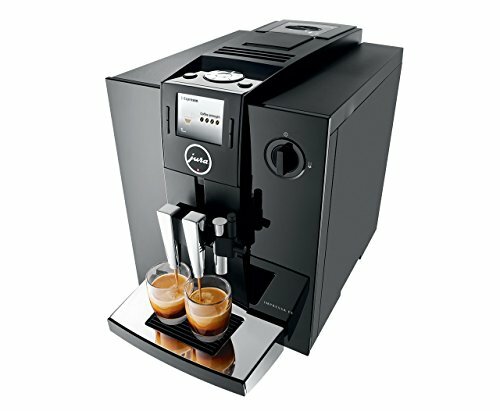 One that does it all, and is easy enough for a novice to use, while simultaneously giving you enough control over the output to satisfy most coffee purists? If you answered yes to any of those questions, then you’re going to love our detailed Jura Impressa F8 TFT review. 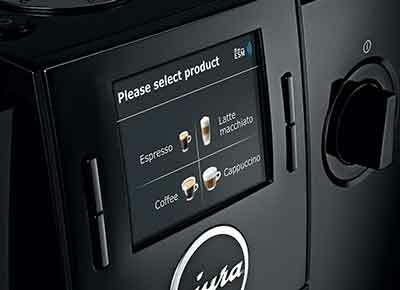 This machine does it all, and it addresses most of the complaints we’ve had with some of the other models Jura produces. In short, this is our kind of machine. It isn’t cheap, but this is a case of getting what you pay for, and by the time you reach the end of this piece, we think you’ll agree. The F8 is awesome and deserves to be on your short list of models to seriously consider buying. Let’s jump right in and see what it has to offer, and what its (very few) weaknesses are! Although the Impressa ​F8 TFT is considered a part of Jura’s “Compact Class,” the first thing to note about it is the fact that it’s got a relatively large footprint, measuring 17.5” deep, 14” high, and 11.2” wide. We’ll talk about the water tank later, but for now, we want to make note of the fact that the reservoir is top-loading which, when taken together with the height of the machine, means that finding it a good home on your kitchen counter may present something of a challenge if you have limited clearance between your counter top and the bottom edge of your cabinets. The machine weighs in at just 22 pounds though, so if you have to move it around from time to time, it won’t present any particular challenge. Jet black, with silver accents and a brightly colored TFT (Thin Film Transistor) display on its front face, it bears unmistakable traces of sleek, ultra-modern European styling that’s sure to bring a touch of elegance to just about any kitchen it finds a home in. It’s constructed primarily with sturdy ABS plastic, and has a few metal highlights and accents, but is Swiss-made, and with proper care should provide years of reliable service. Our Jura Impressa F8 TFT review would not be complete if we didn’t sing the praises of the unit’s water tank. It’s top-loading and holds an impressive 64 ounces of water. As with most of the machines Jura makes, this one incorporates a water filter into the tank. We completely understand the thinking here. If you opt to use the water filter, it’s going to almost completely eliminate the need to periodically descale your machine. On the other hand, if you opt to go that route, you’re also on the hook to periodically buy new filters for the machine, which increases your total cost of ownership. Personally, we’re not big fans of the filter. We just use distilled water, which accomplishes the same basic goal, without the need to buy filters to keep on standby, but again, we completely understand the thinking, and certainly can’t fault the company for going that route. Some people love the inclusion of the filters; we just happen not to be among their number. Our Jura F8 TFT review would not be complete if we didn’t call particular attention to the bean hopper attached to the grinder. Top-loading, it holds an impressive eleven ounces of beans, which is a nice compliment to the expansive water reservoir. We readily admit to being biased in favor of machines which feature bean hoppers and reservoirs that are of complementary sizes, because they just require less maintenance. When there’s a large disparity between the two (a big water tank paired with a small bean hopper, or vice versa), it just feels like you’re constantly having to stop to refill one or the other, which gets annoying very quickly. That’s not the case here, and we’re very glad to see it! And, if for whatever reason, you’d rather use pre-ground coffee, rather than fresh beans (say, for a quick cup of decaf in the evenings), the F8 comes with a two-scoop bypass doser, also located on top of the unit for easy access. Pro Tip: Super-automatics don’t tend to do well with oily beans, which have a tendency to clog the grinder. For best results, find a nice Medium Roast you enjoy and stick with that! As to the grinder itself, it uses Jura’s patented Aroma+ system, which has specially shaped burrs for faster grinding and quieter operation. That means less waiting, which is good for you. We do have two quibbles with the grinder though. First, the grinders are made from stainless steel. We’d have preferred to see ceramic here (again, especially given the price of the machine). The reason is simply this: Stainless-steel grinders heat up as you use them, and this can result in your grounds having a burnt taste, which completely ruins the complex flavors of the coffee. Not a good situation! Our other quibble is that the grinder only has six different settings. If you’re new to the world of specialty coffee drinks, this will not be an issue. The reason it’s so important is that getting the grind right is one of the most pivotal aspects of making a great cup of coffee. Everyone’s tastes are different, and in our view, six settings just aren't enough to cater to every taste out there. It’s a decent number, but a bit underwhelming, and for a machine in this price bracket, we’d have expected to see more. The Jura Impressa F8 TFT utilizes a single aluminum boiler with a stainless-steel lining and Thermoblock technology to allow for rapid heating. The fact that it only has one boiler means there is a small amount of wait time as the boiler changes temperature if you’re making a milk-based drink, but it’s by no means excessive. There’s no fine-grained temperature control, but you can pick between “normal” and “high” temperature for each drink you make. Most American coffee drinkers prefer their coffee hotter than Europeans, so we’d recommend just making sure everything is set to high, and you’re good to go. 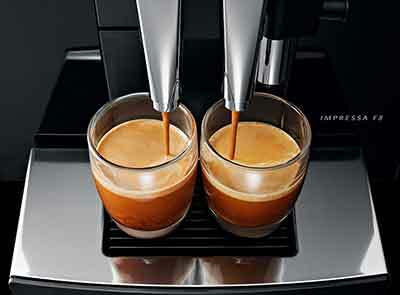 We like the form factor of the spigots on the Impressa F8, but we do have one quibble. They will move up and down to accommodate cups ranging from 2.2” to 4.4” in height. We’d have preferred it if they moved up high enough to accommodate a 6” cup, but this range is acceptable for most people and is certainly not a deal breaker. Note: If you’re making a milk-based drink, your foam and cream will come out of the spigot on the right, and when that’s done, coffee comes out of both. This is the heart and soul of every super-automatic machine, and as such, we’ll devote a good deal of space in our Jura Impressa F8 review covering all of its features. The first thing to mention is the fact that the brew unit cannot be removed for cleaning. That’s not the case on all brands and models, but it is here. You’ve got to periodically use a cleansing tablet, but that process is very straightforward, and the machine will let you know when it’s time. Simply follow the prompts, refer to the manual your first time through, and you’re all set. As to the control system and interface, almost all the action happens on the full-color TFT display. While some might be inclined to call this a gimmick, if you spend any time at all using the machine, you’ll realize that it’s much more than that. The presence of a full-color, interactive machine makes navigating through to all your options a breeze, and the graphic representations of your drink options make it a snap to locate exactly what you’re looking for. Comparing this to say, navigating through a clunky old LED-based system and it’s just no contest. The TFT display wins hands-down, and we give this model high marks for ease of use for that reason. Here’s a specific example to serve as a case in point. Almost every semi- and super-automatic espresso machine on the market today allows you to set the auto-shutoff time, and this one is no different. On an LED-based machine, you’d have to slow-walk your way through 2-3 nested menus, then use the buttons or control dial to set the time, then save, and back out of the menu. On the TFT display, you turn the dial on the top of the machine to maintenance, select the auto-shutoff option, turn the dial again to set the desired timeframe, save and done. Quick and efficient. If you’re new to the world of specialty coffee drinks, then odds are, you’ll be perfectly happy with the default settings for the various drinks it can make. Simply dial in your selection, put your cup under the spigot, push the button, and wait. If you’re a coffee purist, you’ll love “Expert Mode,” which allows you to go in and customize all the important variables that lie behind whatever drink you’re making, allowing you to tailor it to your specific tastes, and save those settings for one-touch use later. Note: Where shot strength is concerned, on the TFT display, it’s measured in one to four “beans,” with one bean being weak, two being normal, three being strong, and four representing extra strong. Just set to taste and enjoy! Another of the variables you can set is temperature. Two options here: Normal and High. In practice, most people tend to just set it on high and leave it there, but for some drinks, you may find the normal temperature to be a better mix. This preference for the high-temperature setting is especially true if you’re coming to this machine from the world of drip-brew coffee makers. On the highest temperature setting, the drinks this unit make will be on par with the temperature you get out of your old drip-brew coffee maker, although if you add milk to the equation, that will lower the temperature some. Twenty-four possible drinks in all! Again, each can be completely customized, and even renamed, which is fun. There is one aspect of the unit that coffee purists probably won’t like, however, which brings us to our next topic. 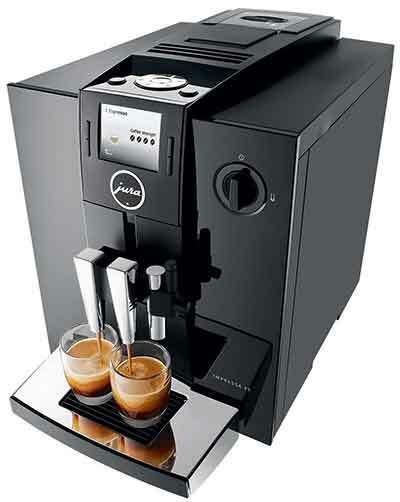 The Jura F8 coffee machine utilizes an auto-frothing system with their patented “Fine Foam” technology built in. That’s great, and indeed, ideal for those new to the coffee world, but purists will be disappointed that you can’t detach the spigot and use a proper frothing wand, so the amount of control you have over this part of the process is somewhat limited. We were surprised to see this, especially given the price of the machine, but for the greater bulk of the coffee drinking population, the loss of control in this area won’t be a deal breaker, and you do have some control over how much foam you get from the menu customization settings. Note that you can also buy a Jura-specific milk unit that comes with a canister and a small receptacle to keep it in, which keeps it cool. While that’s a nice addition from an aesthetic perspective, it’s certainly not necessary, and just about any container will do. We recommend buying a small stainless-steel pitcher and leaving it at that. Final Note: This has more to do with aesthetics than anything else, but we’re not fond of the “plastic tube insertion” auto-frothing methodology because it makes your machine look like a bit like a high school science project. 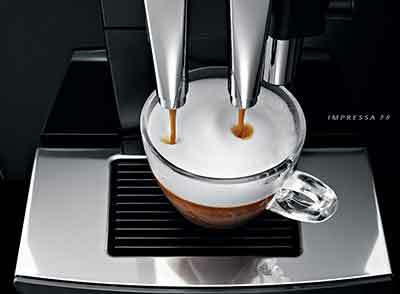 We’d much prefer a unit with the frother built into the machine, but again, a minor quibble. Great espresso lies at the heart of most specialty coffee drinks, and espresso is made very differently from regular coffee. A drip-brew machine, for example, simply relies on gravity to carry the water through the grounds and into your cup or pot. Espresso is made under pressure, which is measured in bars, with one bar being equal to atmospheric pressure at sea level. It takes at least 9 bars to make a good espresso, and the Jura Capresso Impressa F8 utilizes a pump rated at fifteen bars, so you won’t have any problems on that front! This will be a short section because the Jura Impressa F8 doesn’t have a cup warming tray. 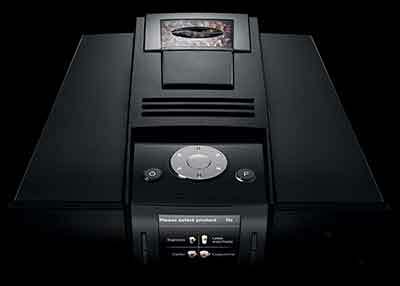 Not all super-automatics do, but we consider this a missed opportunity, especially given the price of the machine. While pure coffee drinks are hot enough for most users, milk has to be steamed at a lower temperature, and of course, mixing milk with your coffee is going to lower the temperature. The presence of a cup warming tray could go a long way toward alleviating this problem, but a viable workaround is to use the hot water dispenser to pre-warm your cup. It’s not a perfect solution, but it’s an easy option. The ease of use and cleaning stems, in large part, from the TFT display and the organization of the menu options it displays. 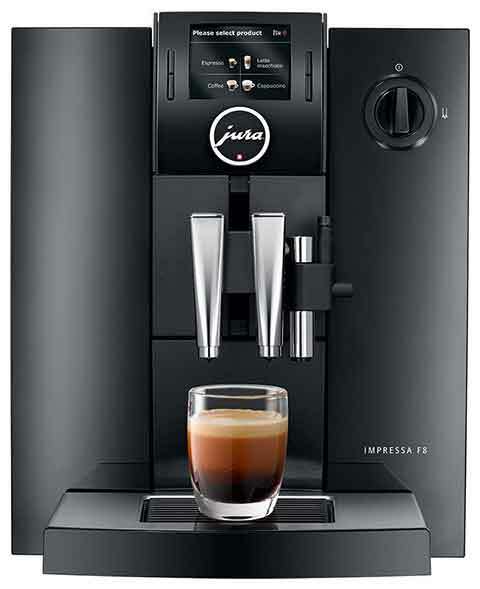 In this regard, the Jura Capresso F8 is flat-out amazing. A lot of the cleaning options are automated, and even the ones that aren’t come with handy reminders delivered to you via the display screen. When it needs something, it’ll let you know. Initial setup can feel a bit daunting at first if you’re not tech savvy, but seriously, if you can use a smartphone, you’ll be up and running on this unit in no time, and after three or four drinks, you can safely say you’ve pretty well mastered it. That’s good design, and a great use of technology, so kudos to Jura for that! At this point in our Jura F8 review, as you can see, there are a lot of things we genuinely like about the unit. It’s expensive, but it’s also quite robust and full-featured. Most of our complaints are relatively minor ones. Individually, none of them are big deals, but collectively, they might make you pause. We’ve tried to be as thorough as possible in our Jura Impressa F8 TFT review, and we really do like the machine. It’s great for specialty coffee novices and offers enough control to satisfy most coffee purists, with the frothing system and limited grind options being the significant shortcomings on that front. All things considered then, we’d highly recommend this model to anyone who can afford it. With a gentle learning curve and so many features, it will serve you well for years to come. How Espresso Machines Work. HowStuffWorks. Introduction: Specialty vs. Commercial. Coffee Review.